This is a wonderfully simple hot cross bun recipe adapted from the classic Australian home economics cookbook, Cookery the Australian Way. 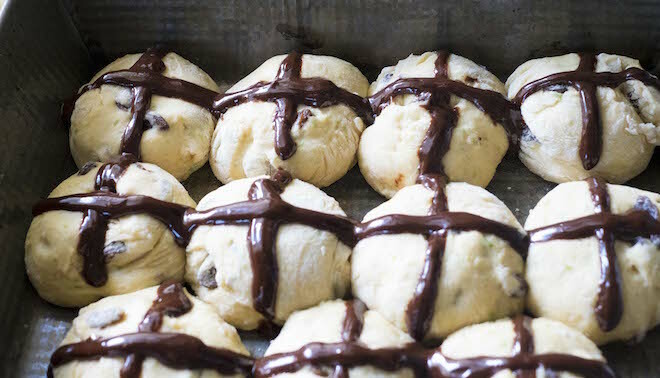 For lovers of hot cross buns without thick peel and too much fruit, this recipe is for you. 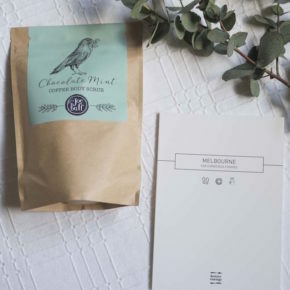 I thought about adding chocolate chips instead of sultanas, but I felt it would overcomplicate the flavours. 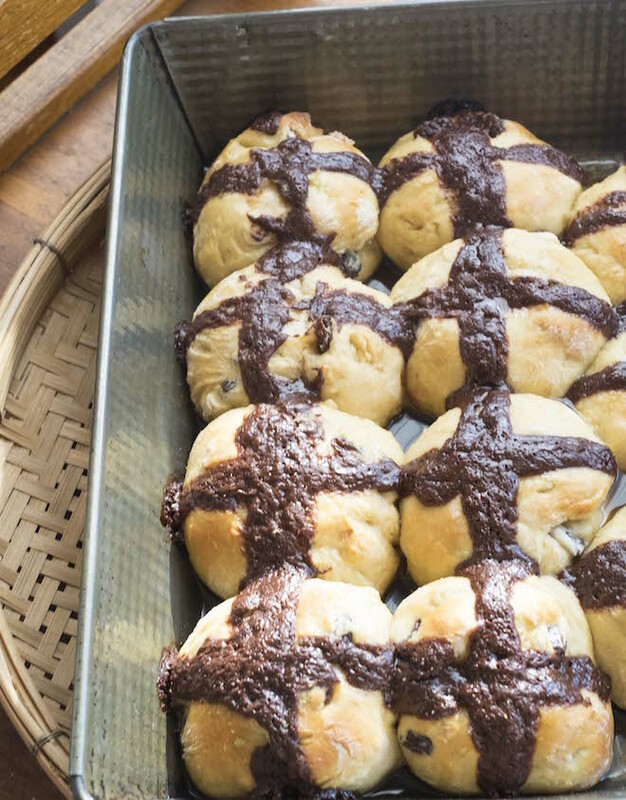 This hot cross bun recipe does involve some time for the proving, and preparation of the piping batter and bun glaze – but trust me when I say it is worth it! You will have some glaze and piping batter left over. 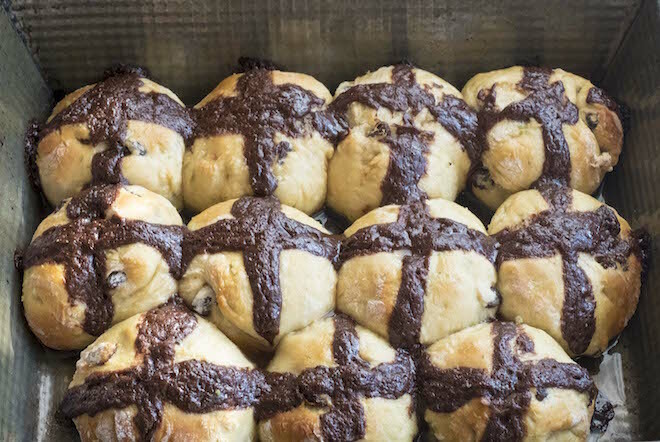 I highly recommend putting them to use for dunking the hot cross buns into while still warm – delicious and decadent! In a bowl, mix the yeast with the sugar and water. Cover the bowl with a tea towel and leave to stand until frothy (should only take 10 minutes). Mix the flour, milk, salt and spices together, then add the sultanas and lime zest. Make a well in the centre of the flour and pour in the the yeast, butter and the egg. Mix everything together until it yields a soft dough. 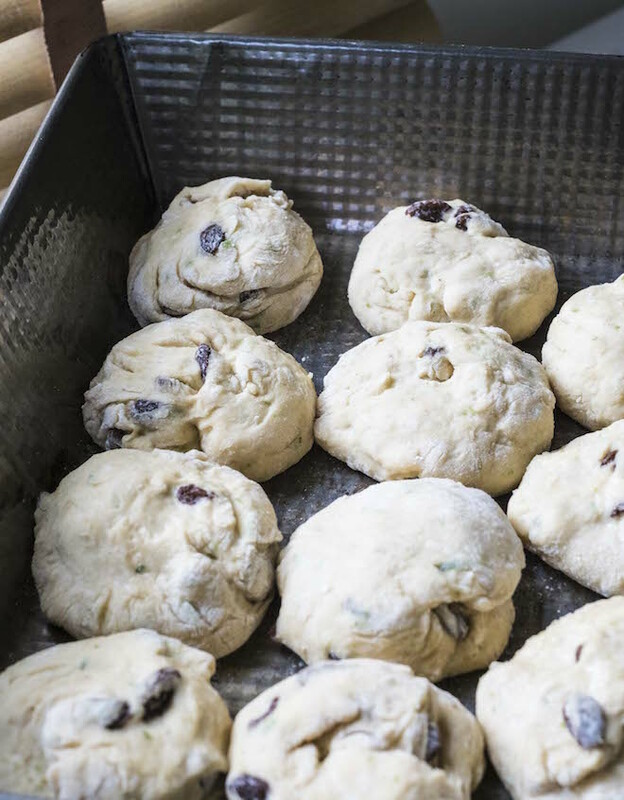 Lightly flour your work bench and knead the dough until it becomes smooth and less sticky. Sprinkle some flour into the base of the original bowl, place the kneaded dough into the bowl. Cover the bowl with a tea towel and allow the dough to prove for 30-40 minutes. Divide the dough into ten pieces and shape into buns. Place onto a tray. Cover the buns on the tray with a tea towel for 20 minutes or so, and preheat your oven to 200°. Whilst the oven is heating and the buns are proving, get started on the piping batter. Add the coconut cream and chocolate chips into a small saucepan and stir on low to medium heat. Once the chocolate chips have melted take the saucepan off the heat. Once cool, add a good pinch of the smoked salt and stir through. 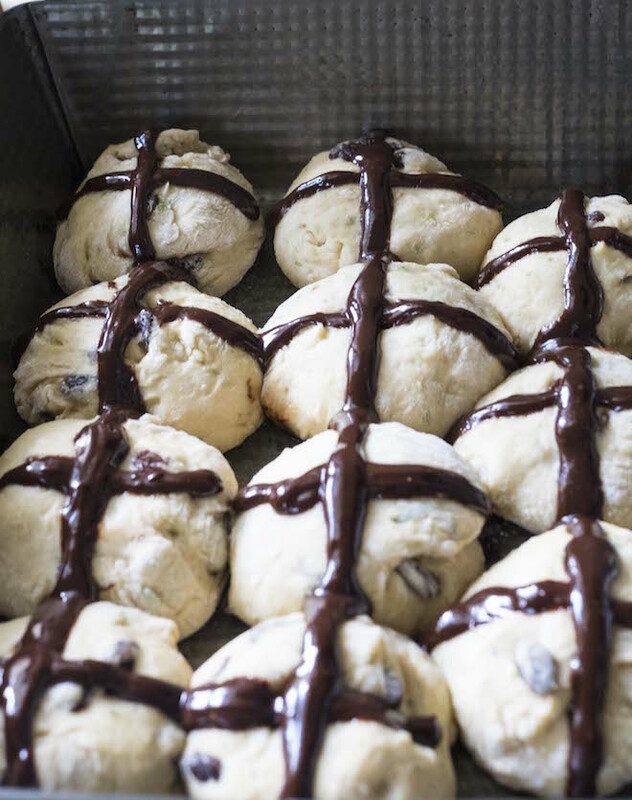 Once the mixture has cooled, add the mixture to a piping bag and commence piping the buns with crosses. 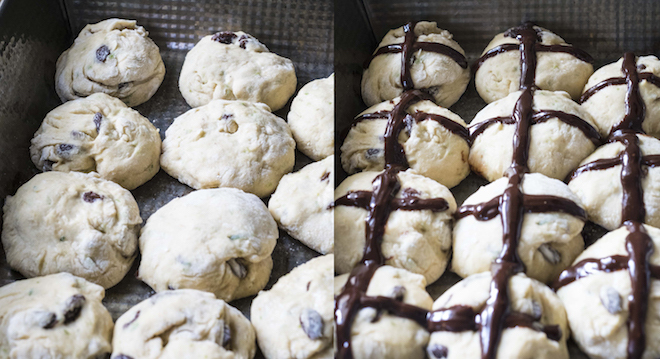 I found the easiest and quickest way was to pipe one continuous line along the middle of each row of buns and then pipe across the other way (as opposed to piping each cross on each bun individually). Once you’ve finished piping, place the buns (on the tray) in the oven and bake at 200° for ten minutes. Reduce the temperature to 180° for a further five minutes. Whilst the buns are baking, get started on your glaze. In another small saucepan, combine the bun glaze ingredients and stir until the mixture begins to boil, then take off the heat and allow to cool. Once the buns have baked, take them out of the oven and allow to cool. Brush them with the glaze and once the buns have become warm, it’s time to tuck in! As mentioned earlier, I highly recommend dipping them into the left over glaze and piping batter for an extra decadent treat. Notes: *gelatine – I used one sheet of gelatine leaves (breaking the leaves down) and soaked it for about 10 minutes in cold water. I took a teaspoon of the mixture then added it to the glaze mix before heating.